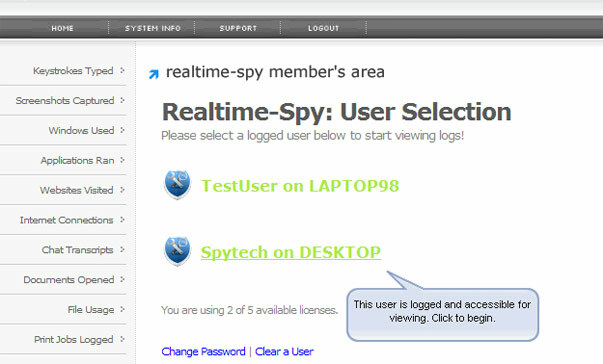 Use the guide below to install Realtime Spy on your computer in 10 easy to follow steps. If you have any questions along the way do not hesitate to contact our staff and we will be glad to assist you. 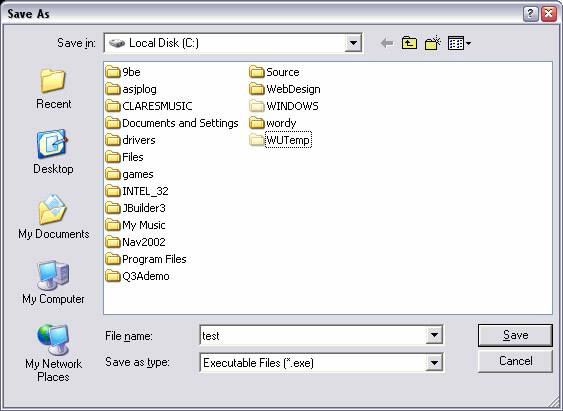 After downloading the Realtime Spy install file navigate to where you downloaded (in this example the Windows desktop). Double click on the Realtime Spy install file to begin installation on the computer. Note : After installation is complete you can delete this file. 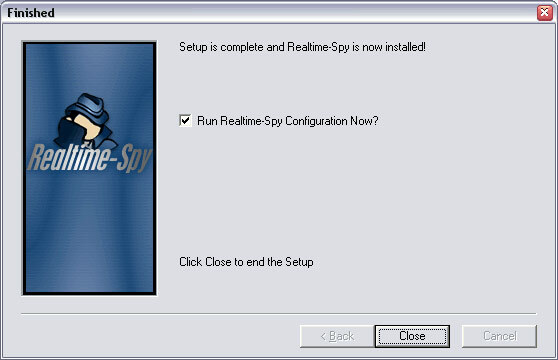 Upon finishing the installation you will be able to run Realtime-Spy's configuration file immediately. Do this and continue to the next step. You will now see the Realtime Spy configuration window. 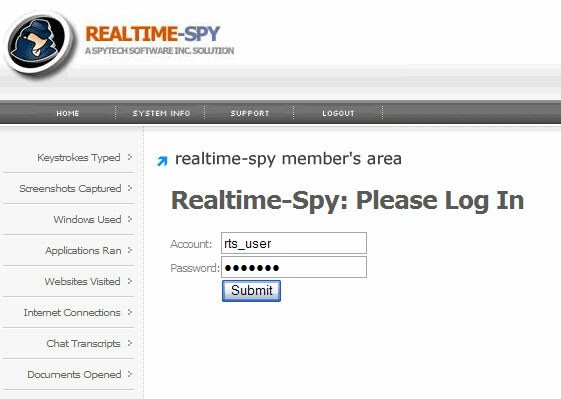 Enter in your username and password that you received after purchasing Realtime Spy. These must be entered EXACTLY as given. They are case sensitive, and take care not to mix up 0's with O's and I's with l's. 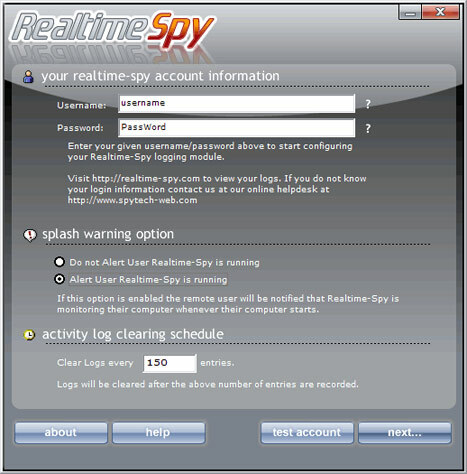 After you enter your username and password, choose whether or not you want Realtime Spy to display a splash warning whenever it is ran and how often you want it to clear its logs. After you enter your username/password and select the options you want - press "next" to go to the next configuration panel. When you click "next" Realtime Spy will verify your settings. If they are correct you will be able to configure your monitoring options, as shown below. Once you have your options set click "create" to create your logging module. Click "create" to create your logging module. You will be prompted for a name to give the file you are creating. In this example we have named it 'test' - you can name it whatever you want. Click Save and you will receive a message similar to the one below. Remember the location of the file you have just created! Now it is time to send out the file to the remote PC. 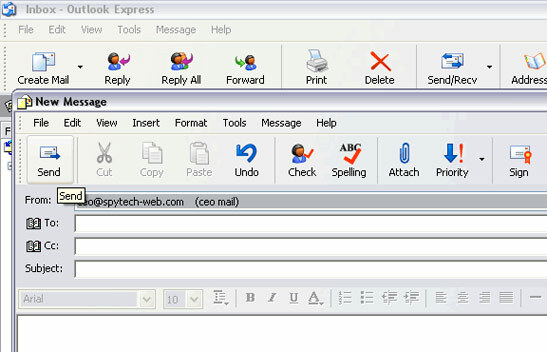 In this guide we are using Outlook Express on Windows XP. 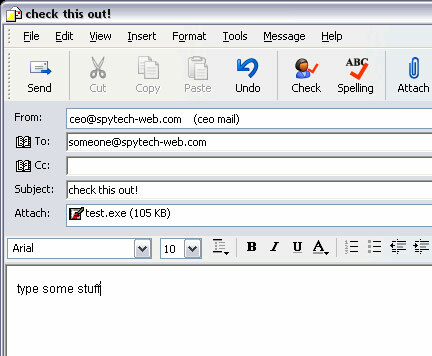 Click the Create Mail button to open a new mail window. Click ATTACH and navigate to where you saved your Realtime Spy file you created previously. Click on the file and then click 'Attach' to attach the file to your email. You will now have to enter a recipient for the file you are sending, as well as an email subject and body. Notice the size of the Realtime Spy file - it should be approximately 100-120kb at all times! Once you are ready to go click Send to send the email! Enter in your username/password at the prompt to continue! You will be presented with your Realtime Spy webspace. Here you can select and view users that were logged with the file you sent out. 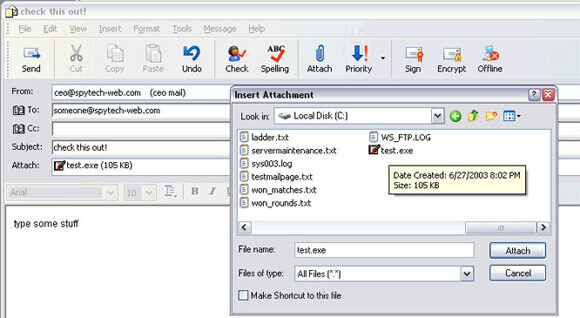 Note : Users will only appear after they have downloaded and executed the file you have sent them. 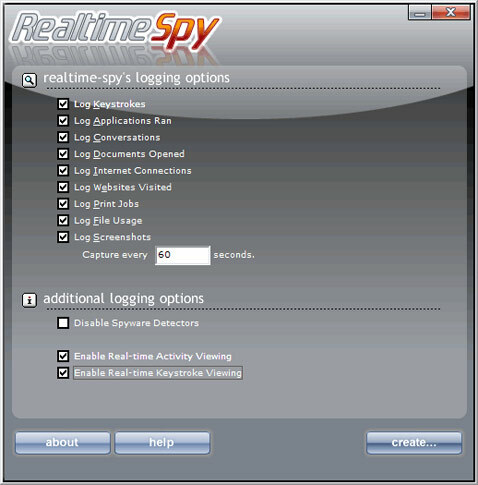 Realtime Spy is available for immediate download. Using our secure server you can purchase, download, install, and begin monitoring your computer in less than 5 minutes!